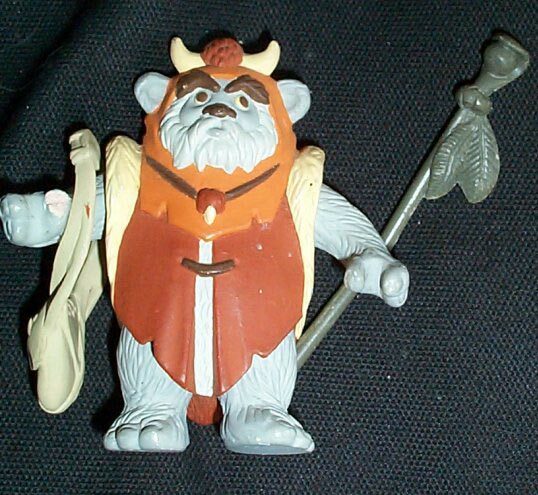 Seen here is a pretty incredible series of prototypes relating to the unproduced Ewoks Chief Chirpa figure. First up is a clay rough. It's basically a one-piece rough sculpt, which lays out the details planned to be included on the figure in a preliminary form. As you can see it's broken in some areas, but given that these clay roughs are next to impossible to find, it hardly diminishes the coolness of the piece. 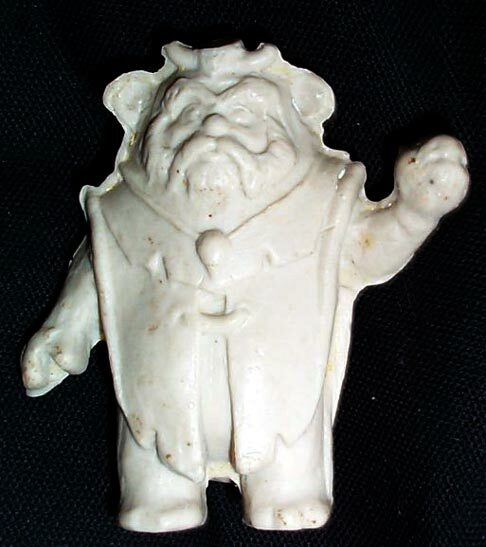 When the clay was finished, a mold was made of it, and a wax copy similar to what you see in this second photo was cast. You can still see the flashing around the edge of this thing where the excess wax in the mold seeped out over the edges. This second preliminary wax sculpt is much more refined. You can see the extra detail, as well as the different shape of the figure's tunic. But it's still a one-piece job. 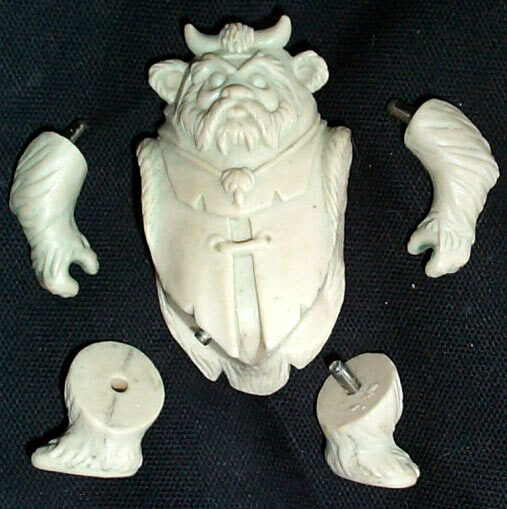 This finished wax sculpt, on the other hand, has had all the joints and metal pins incorporated into it. 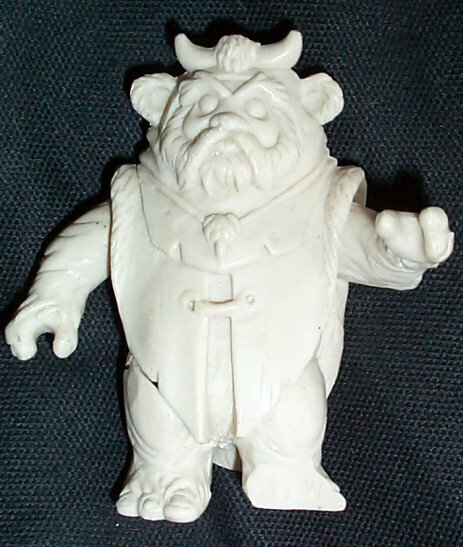 This is a sculpt that was intended to serve as the master for the creation of hardcopies and, later, production tooling. 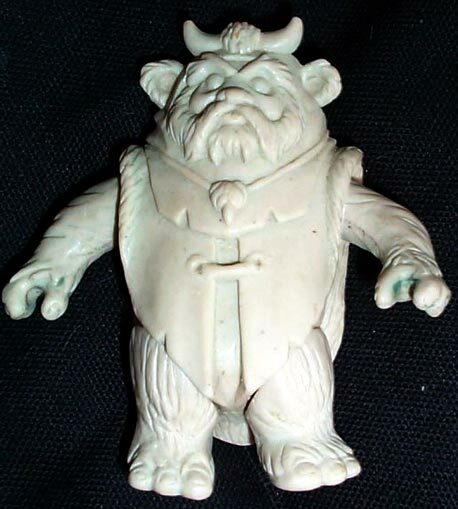 But, as James Gallo and Isaac Lew have noted, it's not a sculpt of the finalized Chirpa figure. Rather, it represents a presumably earlier, alternate sculpt, one for which production molds are not believed to have been made. You can see a hardcopy of this alternate here, however. Also note that you can still see the traces of green mold release near the hands, as well as the parting lines, drawn around the perimeter of the piece in pencil. Lastly we have the finished, painted hardcopy of the figure, complete with its accessories. But note that it's not a hardcopy of the above sculpt; among other details, it lacks the ringlets around the cord that binds the two flaps of the figure's tunic. 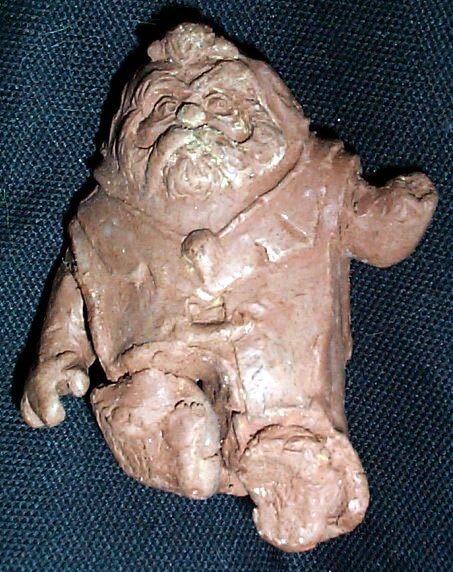 Rather, this is a hardcopy of still another sculpt of the Chirpa figure. It's still nice to have in this series, though. Following a figure from inception to completion like this is quite an experience. Chris is lucky to be able to claim so many different phases of the production process as his own.